Need heavier duty hose reel for your Automotive Shop or for your Truck Shop? Reelcraft series 4000-5000 offers the spring driven retractable hose reels you need. Reelcraft has reels for air, grease, oil and water. Reelcraft also offers electric cable cord reels to keep your work space safe from trips and falls. Need an ecnomical choice for a medium duty, lighter weight, spring-driven hose reel? 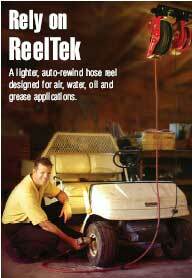 Reelcraft's ReelTek Series RT is your best economical choice. It can be used for less demanding applications, yet can withstand industrial and commerical use. This industrial-grade drive spring is protected from the environment in a polypropylene spool--which provides a longer life for your reel. The guide arm adjusts to seven differnt positions.